Yogyakarta-Friday, November 2th 2018, Master of Science and Doctoral Program, Faculty of Economics and Business, Universitas Gadjah Mada (MD FEB-UGM) again held a design thinking workshop. 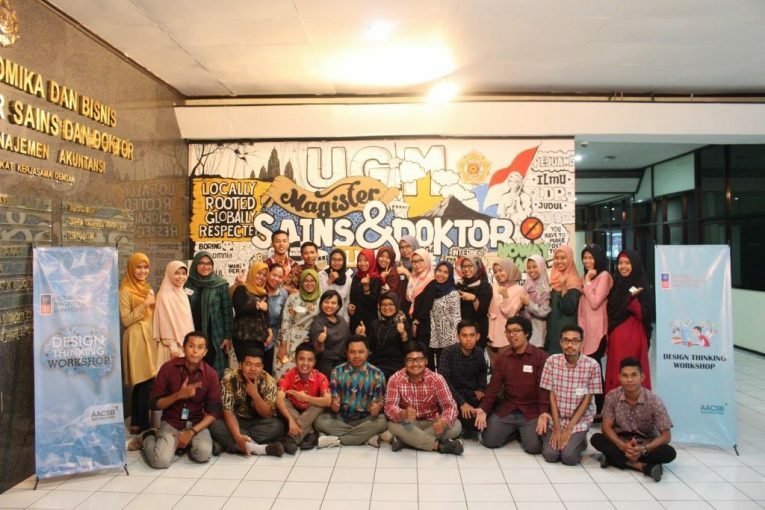 This design thinking workshop was held for Magister Science Management students who were taking the second semester. Still with the same speaker as the design thinking workshop held last week, Nurul Indarti, Sivilekonom, Cand. Merc., Ph.D and RR. Tur Nastiti, M.Sc., Ph.D. said that the design thinking workshop was a medium to encourage students to think differently, innovatively and critically. The facilitator then forms five teams; each team consists of 5-6 people. Formation of teams to build the paradigm of ‘never hunting alone’ and also a means to get to know each other. Each team follows four steps in doing design thinking namely, discovery, interpretation, ideation, and experimentation. The academic, admission, finance, human resources, and secretary of the MD FEB-UGM become the objects the team tries to solve. The team will identify existing problems through interviews with the Head of Academic, Admission, Finance, Human Resources, or Secretariat of the MD FEB-UGM then try to think of alternative solutions and problem-solving. In the experimentation section, later each team will build a prototype that illustrates the problem and the alternative solutions offered. In her explanation Nurul Indarti, Sivilekonom, Cand. Merc., Ph.D., said that the design thinking workshop was deliberately given to students who were taking the second semester because students must first understand how the learning process at MD FEB-UGM. Then in the process of understanding, this workshop was presented as a guide in the framework of useful and critical thinking. RR. Tur Nastiti, Ph.D. as the speaker also mentioned that through design thinking workshop, participants were taught to understand the problem and think about sharing solutions to the problem. Each participant must even realize that in thinking laterally and thinking ‘out of the box’ is essential.